This biography in words and pictures in the publisher’s fine series on automobile art coincided with an exhibition of the artist’s “The Way We Were” series of some 50 paintings at the John Noot Galleries in Worcestershire, England in October 2001. Brown was present at the gallery opening to sign copies of this book. But—and this the purpose for making such a seemingly far-flung reference—that exhibit showcased “the other side of Dexter Brown” which is so different from his automotive work that he created it under a different name: de Bruyne, an adaptation of D. Brown. In fact, this show was the first solo show for “de Bruyne” whereas “Brown” had had his first solo exhibition already 34 years earlier (1967, Monte Carlo Galleries in Alexandria, Virginia)! This wide spectrum of themes and styles finds expression in such varied output—motorsports, pop art, landscapes, nudes, sculptures—that for some time the public did not realize that the works were done by the same hand! 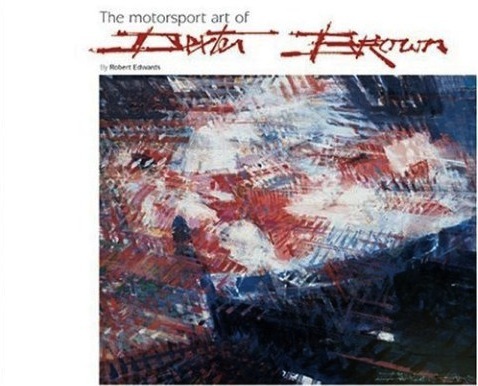 As Dexter Brown he is known to motorsports fans as the painter of dynamic scenes of such violent motion and shrieking color that the painting seems to have disintegrated into abstract fragments that have to be reconstituted by the viewer in his own head—much like an actual racecar thundering by “rattles” the observer’s senses. As M. de Bruyne he is known as the painter of bucolic, romanticized paintings of the Edwardian days of motoring in the Impressionist vernacular in the style of such masters as Renoir, Manet and Monet. In either guise he has made his mark as a very fine artist who just happens to paint cars sometimes. Brown (b. 1942) has been wielding the brush since the age of eight, formalized his self-taught skills at the Harrow School of Art, and has been commercially active—and successful—since the 1960s. 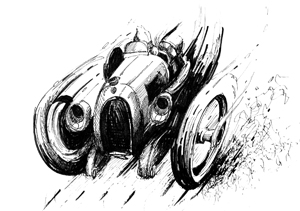 His first commission was an illustration of a Bentley Drivers Club meet at Silverstone for Autosport (the same magazine for which Gordon Crosby once worked). Aficionados of Italian cars will know him as the “house painter” of Pininfarina whose design museum in Turin features his work since 1965 in a permanent exhibit. Brown’s art was very much an insiders’ affair and rarely came to market until auctioneer Robert Brooks persuaded the artist to paint “for stock” rather than just on commission. The thoughtful and wholly sympathetic text by art dealer and writer (and Motor Sport contributor) Robert Edwards presents insights into the artist’s style, motives, and overall oeuvre that will enlighten car enthusiast and art lover alike. Likewise, having the picture captions and commentary penned by the artist himself make the work uniquely accessible. Edwards has several books on Aston Martin to his credit, and his first major book, Archie and the Listers, published by Haynes in 1995, was re-issued by the same publisher. 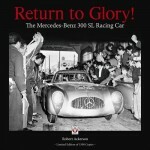 He is also the official biographer of Sir Stirling Moss. The foreword is by Toyah Willcox, whom Brown painted early in her punk rock career. He also did her album covers and even designed her stage costume for the 1981 winter tour. 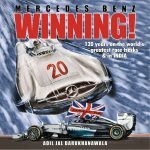 The introduction is by Classic and Sports Car editor Mick Walsh who as a young man was mightily impressed by Brown’s “otherness” and himself attended art school before getting into automotive journalism. 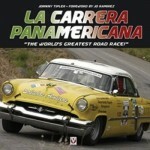 The book is in landscape format and the paintings are reproduced in splendiferous color on glossy paper. Also shown are working sketches and photo studies, as well as examples of his work in the entertainment area, portraiture, and sculpture. The artwork is titled, dated, and lists medium and size. The index leaves nothing to be desired, going so far as to list cars by model number. 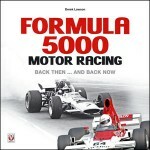 The book is still easily available, just no longer from the publisher as it is out of print. Copyright 2010, Sabu Advani (speedreaders.info) has adapted, with permission, his review written for the May/June 2001 issue of The Flying Lady, the periodical of the Rolls-Royce Owners’ Club (RROC/USA), which he edits. Dexter Brown’s work shows such movement and sparkle when viewing his automotive artwork. Not all artists can do this. Brilliant!